Mount can be shaky at times. Use on a stable platform. Includes little instructions for setup and use. Red dot finder has been reported to malfunction. Described as a compact grab-and-go telescope for the whole family. The Orion 10015 StarBlast 4.5 Astro Reflector Telescope comes assembled and is a great entry level option for the beginner astronomer. At thsi price and the portability of this telescope makes for great viewing by the whole fa,ily, either at home on the deck or take the family outside the city limits for a clearer night sky viewing adventure. The Orion StarBlast 4.5 Astro Reflector Telescope has a primary aperture of 4.5 inches (100-150mm) a net weight of 13lbs and includes an EZ Finder II View Finder to aid viewing. With its parabolic primary mirror, the Orion StarBlast 4.5 Astro Reflector Telescope will provide amazing views of the night sky. Caters and mountains on the Moon appear in crisp detail through this telescope. 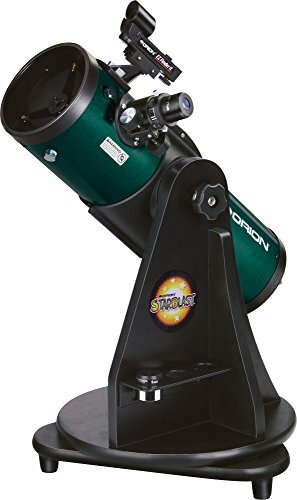 Overall a quality telescope for the price and recommended for beginner to intermediate astronomers.